There doesn't seem to be any updates to the game, so it must be to the drivers. I'm going to have to try this out myself. Probably by mistake. I somehow doubt that somebody over there thought "let's fix that bug that screws up that one game released almost 20 years ago". More like "let's fix that bug that screws up this cult classic, one of the best games of all time, that people have been bitching about being broken for years"
GOG version seems to have been updated to run inside a special window by default and uses a configurator. I assume whatever changes they made to make it run like this also fixed antialiasing. Not necessarily by mistake, there are validators for the DirectX implementation, because up to DX11 most of the work is done by the drivers so the drivers must conform to a very strict behaviour. It's possible that NVIDIA's drivers failed some tests but no one cared because pretty much every game from the last 10 years worked fine, but when they applied for the WHQL certification for Windows 10 they had to pass all the tests -- especially after the "day one" drivers fiasco. Can someone competent find out who fixed it? GoG, or nVidia? Because we seem to be getting contradictory information. If I had the Steam version of TLJ I would run it, and this would answer the question but sadly I do not have it. Uh, I do have the Steam version, so lemme check. The buttons when you exit the game are still a no show, so there are still a few issues. Edit: Still, no idea who fixed it. The Xbox integration overlay does show up when the game starts, so maybe Microsoft also fixed some things. And the DVR works fine and the screen caps work too. But they grab video and images at the game's original resolution. They do that, because the game always runs in 640x480. Did you try forcing AA through nvidia inspector? The photo on top is with AA on, the one on the bottom (where you see the mouse pointer over Charlie) is the default settings. Notice the difference on Charlie's back, right next to his left arm; also April's right arm. The game doesn't look as blurry with AA on as it looks on the photo. I guess the autofocus got confused with April's face (the face detection thingy did lock on to her face). The last time I tried to play TLJ with anything other than software rendering on, everything was horribly disfigured and freaked me out. I'm not sure if it was AA that did it but I'm not trying it again. You should try again. If you install the GOG version and set the settings the way Darktalon said in preferences.ini and nvidia profile inspector, it makes a huge difference. No more jagged edges; it's all smooth. I did try the AA setting Carlos suggested, but it resulted in none of the character models loading during the opening scene in the prologue, so I went back to the other setting and everything looks great. Even if it doesn't work for you, you can always reset the settings, so you have nothing to lose. Then maybe you could talk someone you know into trying it out for you. It's a huge improvement, if you can get it done. Perhaps. I'm running the GOG version in Windows 7 Home Premium x64 with 32GB system RAM (16GB usable) and a Geforce GTX 970 with 4GB VRAM on my 55" LG 4K TV. 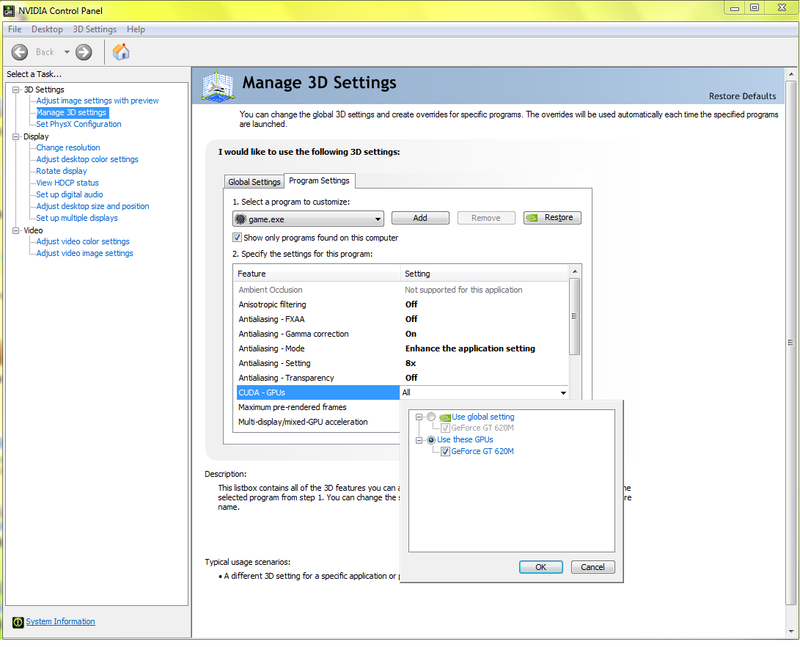 On my i7-64 bit computer with an Nvidia GT620M and 1920x1080 resulution, after adjusting the aspect ratio and display resolution to 1400x1050, these are the settings that will eliminate jagged edges. I normally play without overriding or enhancing the original game. The GOG version is no better than the DVD version released with "Dreamfall, Game of the Year Edition". I have the GOG version only because I thought they would make the game menu fully compatible with Windows 8.1 and 10 - but they haven't. Unfortunately I tried the settings on my laptop which has an integrated GTX 940M / Intel 530 display. and it had no effect on eliminating the jagged edges. The display on the laptop looked no better than the display on a 42"" TV. So, apparently I can adjust the antialasing on one computer but not the other. I don't know if I agree that the GOG version is no better than the DVD version. I've tried both, and in the GOG version, the dialogue options don't run off the screen like they do in the DVD version. I didn't mess with the aspect ratio or resolution in either version. Perhaps doing so would fix the DVD version, but the GOG version works perfectly for me straight away, and looks even better with the AA fix, which I haven't tried on the DVD version. This is good to know. My tests were with the DVD version. I will have to try them on the GOG version. I haven't experienced the dialogue issues you mentioned, or any other issues, with the DVD version. Prior to the DVD version, in Windows XP I was using the 2-CD English Language release - Build 147. The Updates 157 & 158 were added. Both the DVD and the GOG versions are updated through 161 which include the update for multicore processors. The GOG version shows game build 142 - which was the build of the original English release in 2000 for Windows 9x. GOG has obviously applied all the Updates even though the Build identification has remained the same.